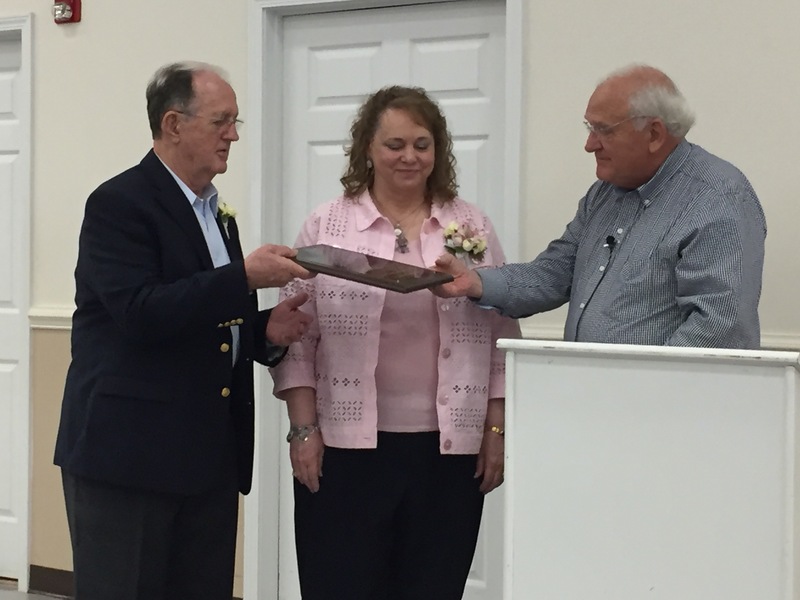 SUMMERDALE, Ala (BNc) — Jerry Olin and Frances Davidson were honored with a retirement party Saturday, June 2, 2018, by the Summerdale Church of Christ, Summerdale, Alabama. Friends and family came from far and near to attend the sit-down luncheon and extend blessings to the couple who have spent their lives preaching the gospel of Christ. Jerry and Frances met as students at Alabama Christian College, now Faulkner University, in Montgomery, AL. Immediately after marriage they moved to work with the Ault Road Church in Knoxville, TN. From there they moved to Donalsonville, GA to work with the Donaldsonville congregation. From Donaldsonville, they went into mission work in the fields of Trinidad for two years. They came back to the states and started work with the Spanish Fort congregation. From there in 1981 they began work with the Fairhope, AL church and worked with them 25 years. In 1989 Jerry went into the jungles of Guyana, South America to work with the Amerindians and for 29 years they have worked in this primitive country. Jerry has served as both a minister and an elder in the Lord’s church. Billy Lambert, friend and minister of the Summerdale church, served as emcee for the occasion and expressed both his love and admiration for Jerry and Frances. Approximately 125 guests attended the function. John Langham, who has gone on many mission trips to Guyana read a letter from Roger Comstock at the beginning of the affair. Comstock expressed his regret in not being able to attend the retirement but wrote, “I have benefitted from your wisdom and faith through the years”. Douglas Williams, brother of Frances, lead the opening prayer. Lambert then opened the period for comments from attendees. Both friends and family members told of experiences working with Jerry. Bill Williams, brother-in-law, told of early years in the family. Ken Forrest read Philippians 1:3, “I thank my God upon my every remembrance of you.” He shared how he heard of Jerry Davidson for years before moving to the Summerdale congregation and then realizing he was actually working with the man himself. Forrest praised Frances and told how she had been a party to all of the work as she tended the home when Jerry was away. “You are a legend in the faith,” he said to her. Gene Johnson told of going to Russia and having to use an interpreter to help him in teaching. After going to the English speaking Amerindian villages he fell in love with that area and has gone 37 times as of last March. His recollections brought both laughter and tears to those attending. He related how on the plane coming home Jerry would ask, “Brother, you are going to go back with me in October, aren’t you?” Davidson was always recruiting others to go with him to teach the gospel. He told of how Davidson could keep 24 people on a mission trip united. He shared how the people of Guyana respected Jerry and how he could go in about any village because the people knew him and respected him. Tears were witnessed in the eyes of different ones when hearing stories of trying times while on mission trips with Davidson through the years. Some told of sleeping in one-man tents, crossing rivers and having their clothes and supplies soaked when the large army truck carrying them became stuck in the middle of the river. Howard Pitts related how he started going to Guyana in the Spring of 1999, and through the years has become known as “Howard the baptizer”. He told of how hard it was to walk in sand about 6” deep and how tired they got while walking in it. He told of “walking ten miles to find little round huts with nothing but a swinging bed and a chair or two in them, and meeting some of the nicest people you have ever met”. James Pendley, Gadsden, AL told of how he uses his vacation time to go on mission trips. He said he plans to retire in a couple of years and go into mission work full time. He praised Davidson for helping him grow and admits it is no vacation to go on one of these trips. He said, “I thank the Good Lord in heaven for allowing me to meet Jerry and Frances Davidson”. Davidson’s motto has always been. “The Lord’s church in every village and a Bible in every hut”. Jonathan Davidson, one of the three Davidson sons, served as family spokesman and spoke tearfully, joyfully, and thankfully, of memories of living and growing up in the Davidson home. He invited those present who had ever gone on a mission trip with his daddy to come forward and be recognized. Twelve people came forward and Jerry expressed his love and appreciation to them. Billy Lambert presented the Davidsons with a plaque of appreciation and closed the function with comments from Raymond Elliott, Prattville, AL. Elliott said, “In my opinion, Jerry Davidson is doing the greatest mission work in the church today.” Lambert added, “If you look at the proof of his labor it is hard to argue with Raymond. Jerry is a master at raising money. He knows how to do it. He knew how to do this work and he did it well.” He then read 1 Thessalonians 2:1-8 from the Bible and said he thought of this text in relation to Jerry & Frances’ work in Guyana. Lambert then led the closing prayer. A great example of the merger of two wonderful families who have many members faithfully serving the Lord. While they may be retiring an relocating, I am certain they have not quit. Alabama’s loss will be Tennessee’s gain.